The University of Central Arkansas will present a series of free events aimed at bringing attention to the importance of water, with an underwater concert as the feature event. The event series, “The Water About Us,” will be performed on the UCA campus Oct. 1-6. The underwater concert titled the “Aqurld Waves at the Water About Us,” will be performed three times on both Oct. 4 and 6 in the UCA HPER Center swimming pool. The performances will be at 7 p.m., 7:45 p.m. and 8:30 p.m. each night and are free and open to the public. Tickets are required and available online at tinyurl.com/ydz8y9ga. “The Water About Us” is being presented as part of UCA’s Artist in Residence program. 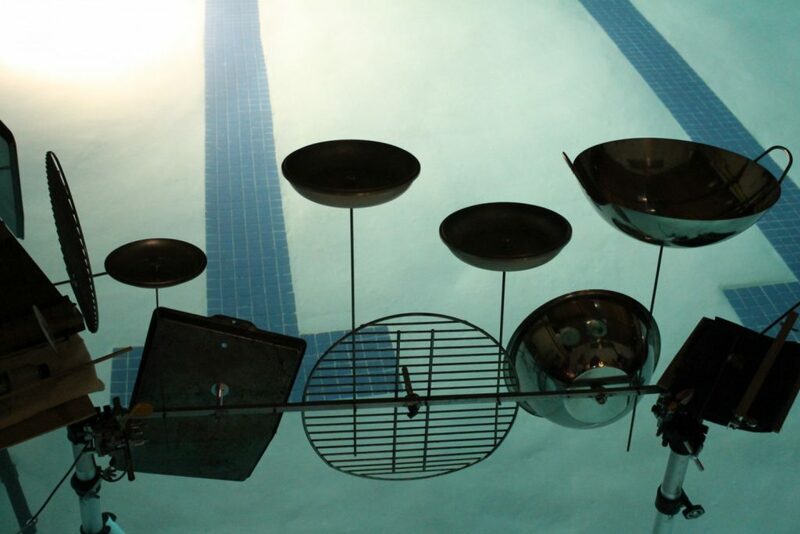 The concert will incorporate music played on special instruments by the percussion group HEARding Cats Collective (artists-in-residence) and is meant to be heard underwater. At the same time, movement artists CORE Dance (artists-in-residence) will perform in and out of the water. The event will also feature video projected on poolside screens. The event allows spectators to sit poolside or to float in the water using foam noodles while the artists perform. Students from UCA’s Department of Occupational Therapy will stand by to help individuals with special needs get in and out of the water. Environmental writer Kathryn Miles will kick off the week of events as artist-in-residence with a reading and book signing Monday, Oct. 1 at 7:30 p.m., in the UCA College of Business Auditorium. Miles will read from her newest book, Quakeland, and discuss the world of environmental journalism. “Common Threads Conversation,” a community story circle that brings the public together to tell personal stories about water and its influence on their lives, begins at 5:30 p.m. Tuesday, Oct. 2, at the Jewel Moore Nature Reserve at the southwest corner of the UCA campus. Kings Live Music at 1020 Front St. in Conway will host a special “Science Wednesday” devoted to the subject of water on Wednesday, Oct. 3, at 6:30 p.m. Panelists will include Dr. Carl Fredrickson (physicist), Joanna Johnson (water management), Rich O’Donnell (percussionist) and Sue Schroeder (choreographer). Professional puppeteer Mark Blashford will round out the week of events with two performances of his water-themed performance “Jack & Jill.” Using hand-carved, folk-toy-inspired puppets and live music, Blashford uses a well-known nursery rhyme to explore contemporary issues of water conservation. Free performances will be held at 10 a.m. Saturday, Oct. 6, at the Faulkner County Library, 1900 W. Tyler St. in Conway, and at 5:30 p.m. at the Presentation Room at UCA’s Farris Hall. Throughout the week, international public artists Maya Gelfman and Roie Avidan will create the components for a water-themed installation, titled “Wishing Well,” for Laurel Park in conjunction with Eco + Arts Fest from 11 a.m. to 4 p.m. During the week, the artists will engage UCA students and Conway residents in workshops creating components for the mural at venues across campus and the city. These components will be reused to create a permanent ceiling mural for the Academic Bridge Center in the Office of Diversity and Community at UCA. “The Water About Us” is funded by a grant from Mid-America Arts Alliance (Regional Touring Program), an agency of the National Endowment for the Arts serving Arkansas, Kansas, Missouri, Nebraska, Oklahoma and Texas. Additional funding is provided by a grant from the Arkansas Arts Council (Collaborative Support Program), an agency of the Department of Arkansas Heritage and the National Endowment for the Arts, and by UCA through Reynolds Performance Hall, the UCA College of Fine Arts and Communication arts fee and UCA Sponsored Programs. For more information, visit uca.edu/cfac/water-about-us/ or contact Seymour at (501) 450-3295 or gayles@uca.edu. The Artist in Residence program is funded by UCA’s arts fee and is administered by the College of Fine Arts and Communication. For more information about the program, call the Office of the Dean, College of Fine Arts and Communication, at (501) 450-3293 or email jdmiller@uca.edu. The UCA College of Fine Arts and Communication includes the School of Communication with Communication, Journalism, Public Relations and Writing, as well as the Departments of Art, Music, and Film, Theatre and Creative Writing. The college’s primary mission is the preparation of the next generation of artists, educators and communicators. For more information about CFAC, visit www.uca.edu/cfac or call (501) 450-3293.